It’s been October for more than a week now, meaning it’s officially pumpkin and pumpkin spice everything season. The Internet is crawling with homemade pumpkin flavored dishes ranging from pancakes to cookies, and brownies to salsas. If you love a certain dish, I’m sure there is a pumpkin infused recipe for it somewhere out there. Here are two recipes I tried out, some more difficult than others, that are worth trying for yourself. Preheat oven to 325 degrees. Grease or spray a 13 inch by 9 inch by 2 inch pan. In a large bowl, mix the cream cheese, butter, 1/2 cup of sugar, 1 egg, pumpkin, vanilla, cinnamon, ginger and 1 tablespoon of flour. Mix all of those ingredients together until smooth. Both the butter and the cream cheese should be very soft before mixing together. In another large bowl, mix the 1 1/4 cups flour, baking powder, salt, unsweetened chocolate, 3/4 cup butter, sugar, milk and vanilla. Mix all ingredients together until smooth. Pour this mixture into the previously prepared pan. Then, scatter the pumpkin mixture throughout the chocolate mixture. Swirl the two mixtures in the pan with a butter knife. Bake for about 60 minutes or until fully cooked. This recipe was one of a kind. As someone who doesn’t usually like things that are infused with pumpkin flavors, I actually enjoyed this recipe. The slight taste of ginger and cinnamon bring the baked good flavoring together. The homemade brownie mix is one of a kind. Nothing is overpowering. This is quite a decadent recipe. Be prepared to essentially have a cake pan worth of pumpkin flavored brownies – that’s quite a bit of pumpkin flavored desserts. They are good and highly worth the amount of prep time it takes to make. Preheat oven to 400 degrees. Line mini-muffin pans with liners. Set aside. In a large bowl, mix all of the ingredients for the cookie cups. You can use a mixing bowl, a hand mixer or combine by hand. No matter how you mix it, be sure all of the ingredients are thoroughly combined. Once fully mixed, fill the mini-muffin lined cups about three-fourths full. Bake in the oven for eight to 10 minutes or until the edges look golden brown. While those are baking, combine all of the ingredients for the pumpkin filling in a medium to large mixing bowl. Stir together until smooth. This may be difficult with the cream cheese, even if softened. Once the cookies are done baking, remove from the oven. Use the back side of a tablespoon measuring spoon to press within the cookies to make room for the filling. Let cool for about five minutes and transfer over to a cooling rack. Repeat this process until all of the cookie batter has been used. When the cookies have cooled completely, place just enough filling in the cookie cups to fill in the dip you already made. Then, they are ready to eat. This recipe, even though it seems slightly technical, is more than worth it. The pumpkin cream cheese filling is one of a kind. It’s a completely different taste compared to the pumpkin brownies. 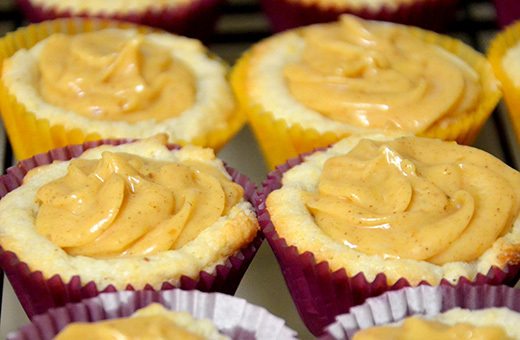 This recipe yields dozens of bite-sized, vanilla and pumpkin flavored morsels. The homemade cookie recipe was significantly easier than others I have made from scratch. The one difficulty I had was making the filling look presentable. Presentation is key for desserts. I was incredibly impressed with this recipe. It was subtle, but brought a new alternative for homemade fall desserts. I would recommend this recipe for anyone who wants a subtle pumpkin flavor, yet something sweet to snack on.